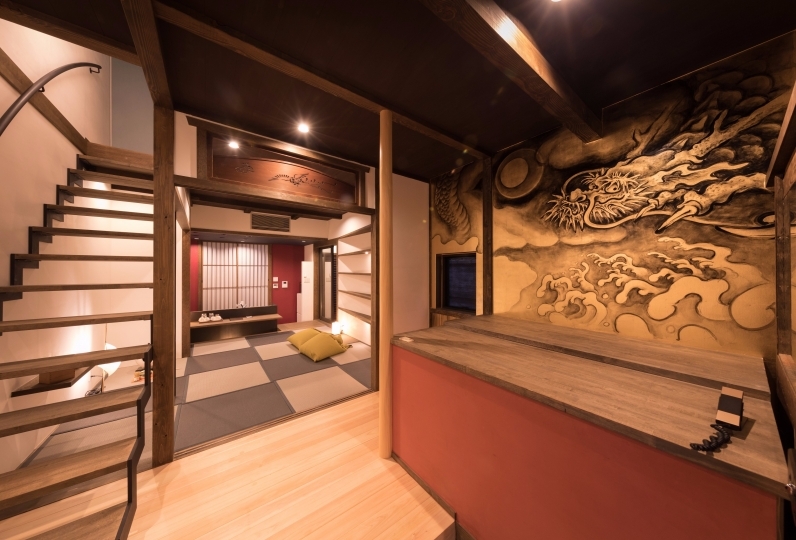 Within walking distance of Kiyomizu Temple and Yasaka Shrine, as well as Gion, Kawaramachi and more. 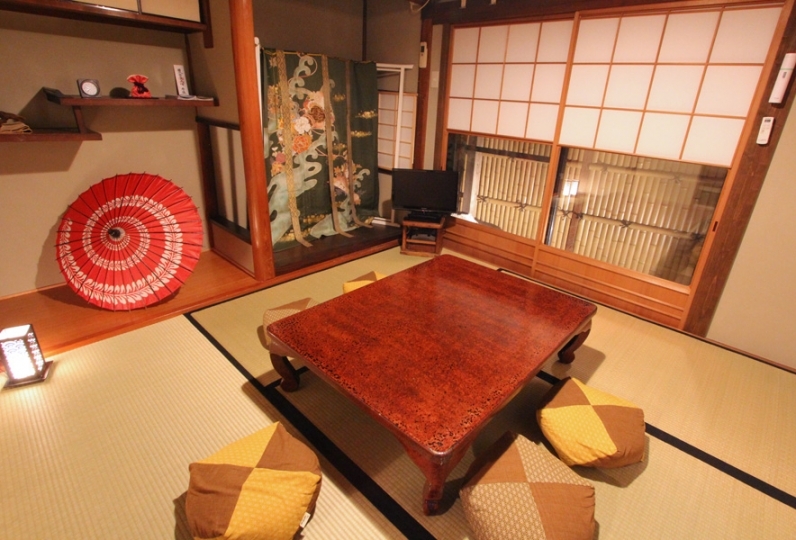 This lodging has 2 single beds and 2 sets of futon, making it suitable for 2 to 4 guests. 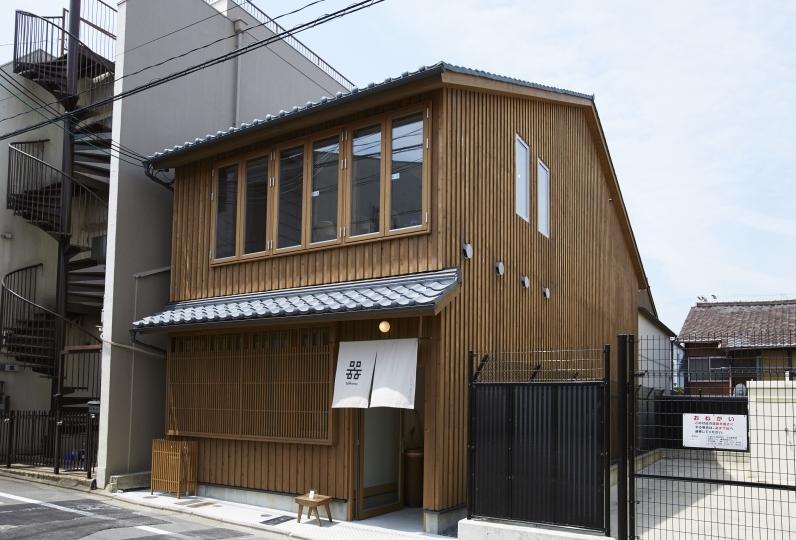 A fully renovated building located in an alley typical of Kyoto, the furniture that were made by Hida Takayama artisans and the Kyoto-style interior match the Kyoto townhouse perfectly. Furthermore, the bedroom has hormesis walls, a first for a guesthouse in the country. A minuscule exposure to radon stimulates the cells of the body, increasing the rate of cell regeneration and resulting in improved immune system and healing. It has the same effect as Tamagawa hot springs, which sees many guests coming for the healing effects of the baths, and Misasa hot springs, whose surrounding area has half of the national average of cancer related death rates. Hormesis is said to be beneficial for people suffering from cancer, diabetes, dermatological conditions, and more. Its effects are known abroad as well, and in Austria, and treatments at Gastein Healing Gallery is even covered by health insurance. From the bath with a scent of cypress to the bedroom with benefits of hormesis, relax in this luxurious environment. It seemed that it was quite dirty if the water bath was not cleaned for a long time, and if I put the hot water, the hot water became muddy due to the dirt, and a lot of floats floated and I was not feeling well and I could not bathe. 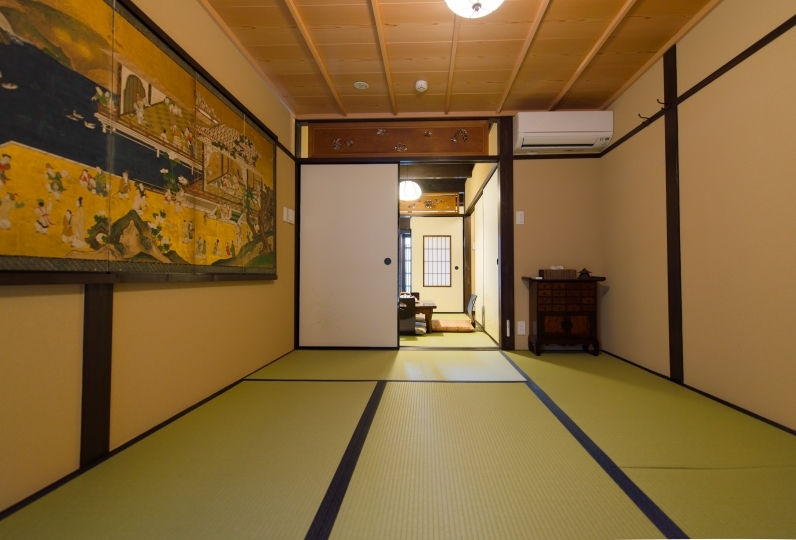 It is very disappointing that the guest house use was the first time and cleanliness was the best point. All things, including dishes, appliances and futons, may not have been washed. I was uneasy and uncomfortable. I used it for my son's graduation trip. 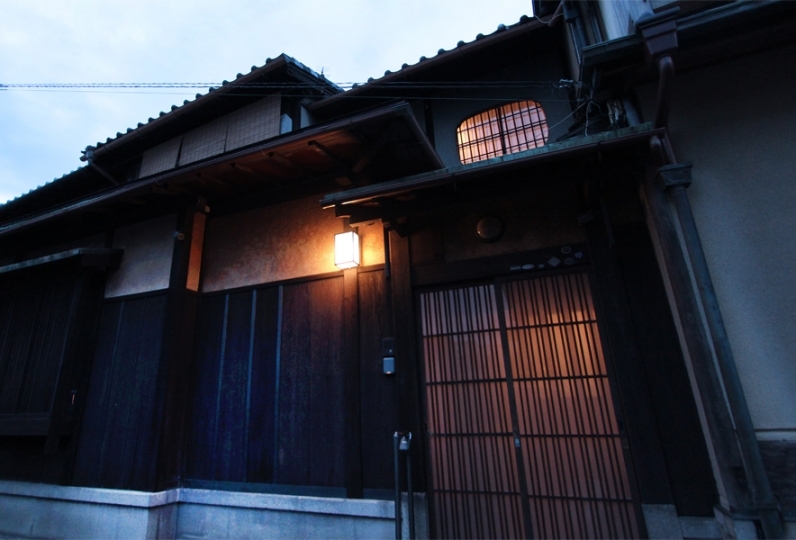 I wanted to stay at a family house in Kyoto, I had trouble watching several town houses, but I decided to like the atmosphere of this townhouse! As I made it a secret to my family, I was really looking forward to seeing what kind of face she would be happy on the day, but as soon as I arrived at the town house I was so surprised and it's amazing from the outside atmosphere! It was a pleasure to hear that he was very pleased to find that he found such a nice place even after he entered. 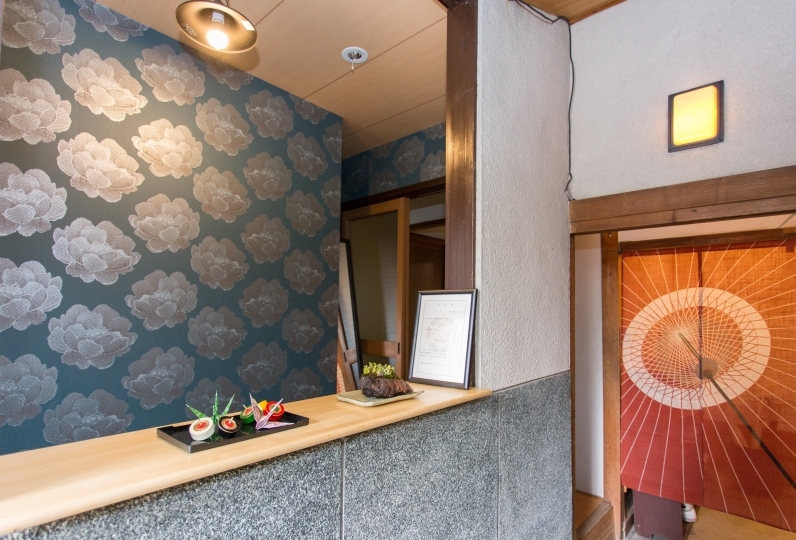 At the time of check-in, the staff member waited for the room to warm and the response was also very good. The bath was also nice, and it was good that I could have a family group with Kotatsu while looking at the lights on the rim. Because I thought that I definitely felt that I was not satisfied with a night, I wanted to stay 2 nights, but it was very disappointing because it was difficult for me to stay at late check-in time on the first day. After all I wanted to stay 2 nights, it was a nice town house! I also want to use it when there is opportunity to come to Kyoto! 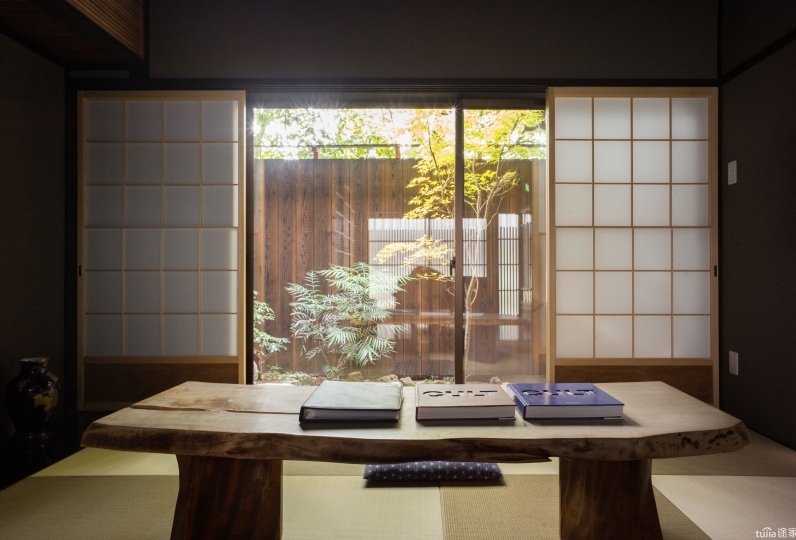 The bathroom has heating, and is fitted with a Japanese cypress bath. There is a view of the garden from the bath tub. Enjoy a relaxing time as you soak in the bath, surrounded by the aroma of the cypress. 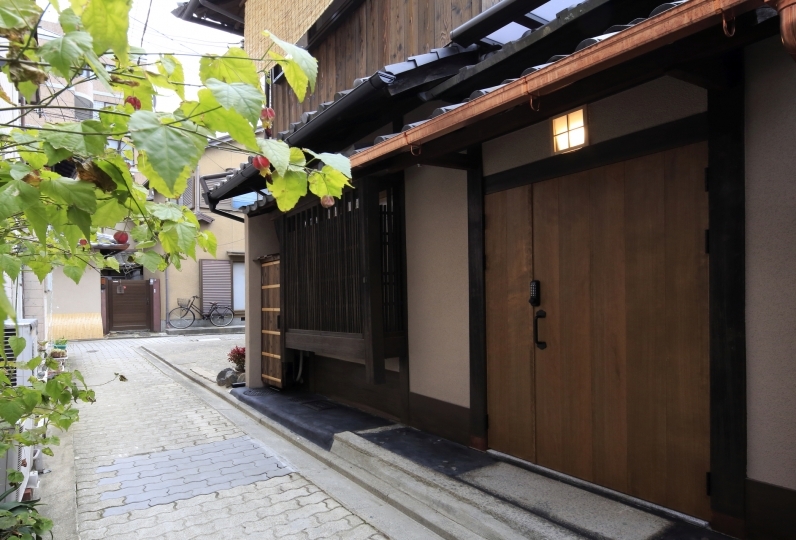 This is a cozy holiday home, consisting of an entire Kyoto townhouse located in a narrow alley typical of Kyoto. It is fitted with a kitchen, washing machine, and more, making it ideal for just one night, as well as longer stays. 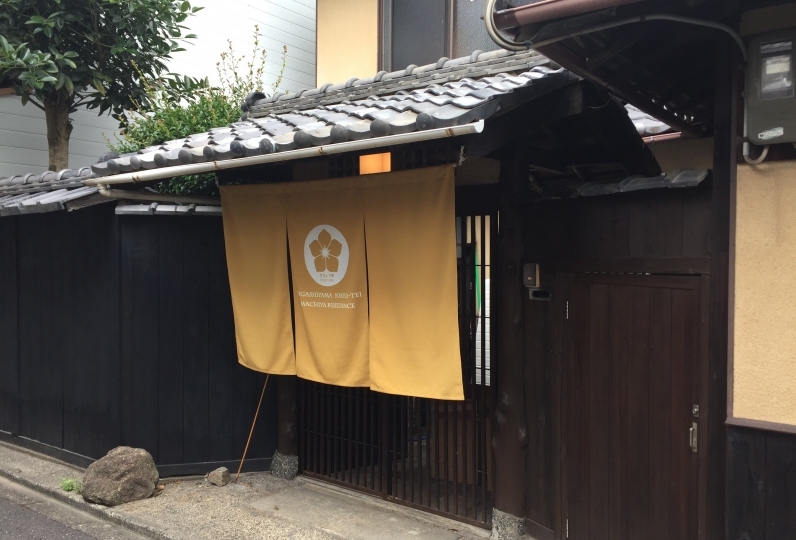 Just a 10-minute walk to the bus stop, super market, and convenience stores, and a 7-minute walk to Keihan Kiyomizu-gojo Station. 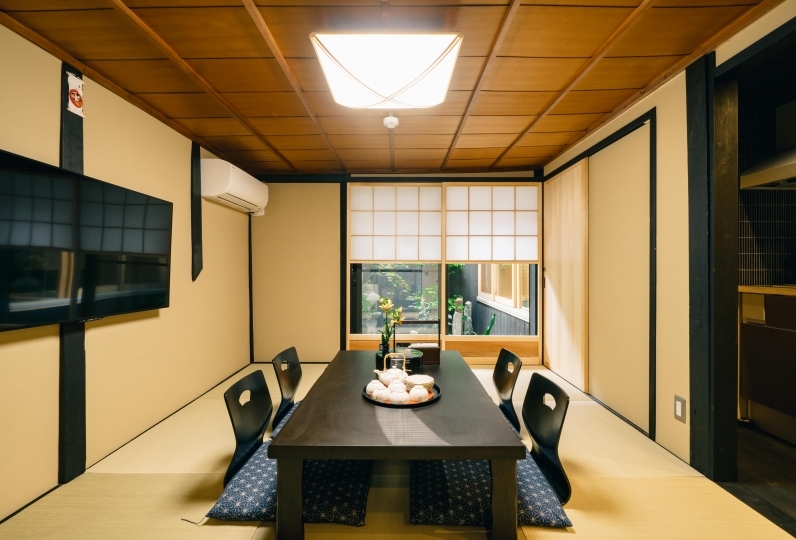 From October 1, 2018, Kyoto City accommodation tax is charged separately. The accommodation tax is required in cash when checking in. Please see the reservation confirmation email from Guest House Kyoto Tachibanaya for further details. ・The entrance is locked with a keypad door lock that requires a key code. 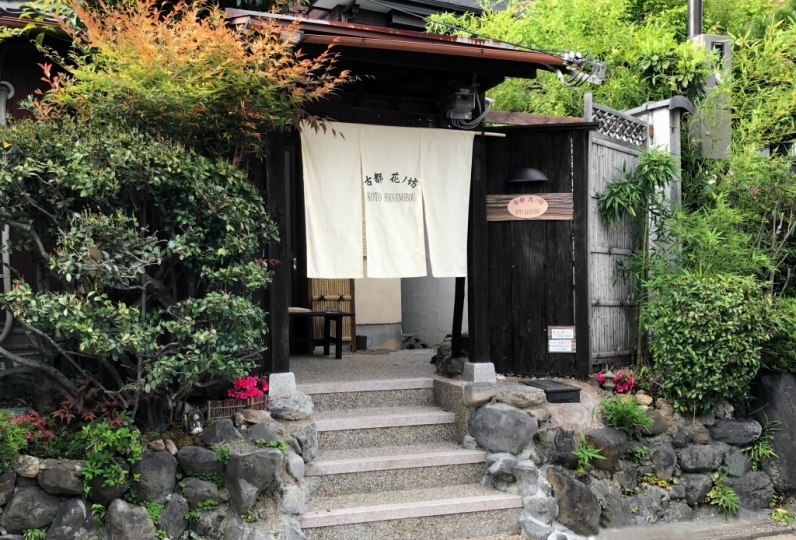 ・There is usually no staff at the lodging. 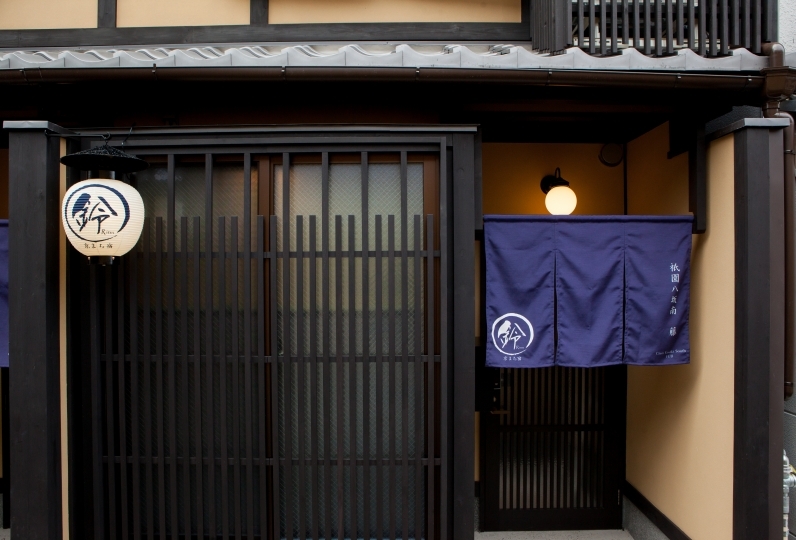 A member of staff will meet the guest at a previously arranged time. ・Last-minute change in time, where the member of staff is required to stay longer or return at a later time, may incur an extra fee. From Kyoto Station take the Kyoto City Bus (routes 4, 17, 205) to Kawaramachi Matsubara (15-minute journey). It is a 7-minute walk from the bus stop.